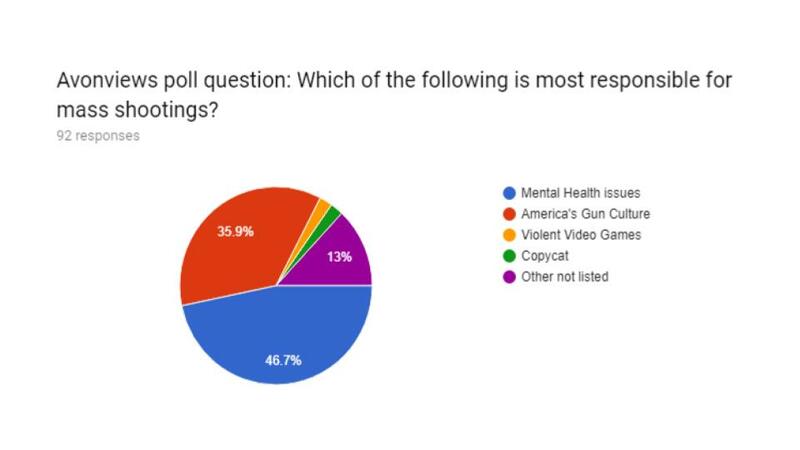 A 10% gap splits the Junior class’s majority opinion about mass shootings, according to a poll conducted this spring by The Avonews staff. Close to 36% pinpoint America’s Gun Culture, while 46.7% place the blame on Mental Health issues. I think that people at this point are just trying to make a name for themselves. In this situation, people are trying to make new history by killing as many people as possible. Yes there has to be something wrong mentally if you would even think of shooting children at school, but I also think they do it mainly for the attention.